Cuba pushed back, saying the U.S. should "desist from the political manipulation of the alleged health cases." The Trump administration pressed its concerns about the mysterious incidents that affected the health of American diplomats and their families during a Bilateral Commission meeting held in Washington DC on Thursday. “The United States reiterated the urgent need to identify the source of the attacks on U.S. diplomats and to ensure they cease,” stated a press release from the Department of State. 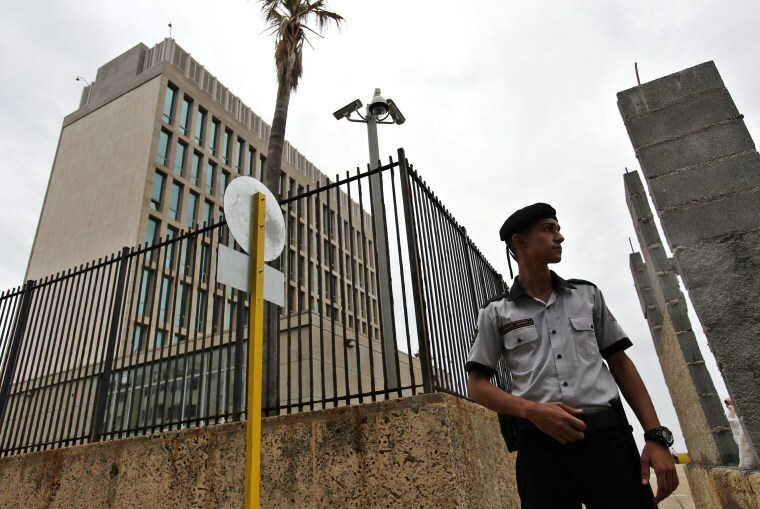 It also “reiterated” the U.S. Embassy in Havana will not provide regular visa services in Cuba until “it is sufficiently safe” to fully staff the embassy. In March, the U.S. made permanent its decision to withdraw 60 percent of its diplomats from Cuba, citing bizarre health attacks that affected 24 embassy personnel and their families. Symptoms include mild traumatic brain injury and permanent hearing loss. Months prior, in October, the State Department had ordered non-essential embassy employees and the families of all staff to leave Havana. The U.S. argued it could not protect them from the health incidents. They also ordered 15 Cuba embassy officials to leave the U.S.
Until recently, the most recent incidents known had taken place in August 2017, leading many to suspect they had ceased. But last week, the U.S. withdrew two more people from the embassy due to health concerns. They are considered potential new cases but have not yet been medically confirmed. The U.S. has said it does not know who is behind the events, but has argued Cuba is responsible for protecting diplomats on its soil. Cuba has repeatedly denied any involvement or knowledge of any attacks. They say the U.S. has used it as a pretext to adopt a new policy that affects both embassies and their consular services. The downsizing of the U.S. embassy staff coupled with a travel warning recommending Americans to reconsider travel to Cuba has had significant effects for Cuba’s economy and its citizens. With fewer employees at the embassy, Cubans who wish to visit the U.S. must now seek visas through U.S. embassies in other countries. Those seeking immigrant visas to the U.S. must go to the embassy in Guyana. The Cuban delegation also urged the travel warning be lifted. American travel to the island has declined sharply. During the first three months of 2018, American travel was 56.6 percent of what it was the year before. In the release, Cuba described the bilateral relationship as having regressed. Trump reversed some of former President Barack Obama’s policy towards Cuba after he took office, by implementing travel restrictions. Entrepreneurs in Cuba say their businesses have been affected by the decline in American travelers. The U.S. side, which was led by John Creamer, Deputy Assistant Secretary of State for Western Hemisphere Affairs, also raised concerns about “arbitrary detention of independent journalists and human rights defenders.” However Cuba has always maintained the U.S. violates human rights with the economic embargo on the island. They stressed it continues to be the main obstacle to any improvement in the bilateral relationship. Property claims were reviewed and briefly discussed, according to a State Department spokesperson. Property claims of approximately 6000 Americans remain unsettled. It’s a lengthy process and one of the key issues for the U.S.
Other areas for engagement that were reviewed include combating trafficking persons, civil aviation, law enforcement, agricultural cooperation, maritime safety, and the environment. This was the 7th time the Bilateral Commission meets since the U.S. and Cuba restored diplomatic ties in 2015. It is the platform through which the two countries identify, prioritize, and schedule initiatives, including specific dialogues and working group meetings. Some of the topics covered are dialogues on human rights, law enforcement, claims, and migration, according to a State Department spokesperson for the Bureau of Western Hemisphere Affairs. Both sides agreed to hold the biannual migration talks and law enforcement dialogue later this summer.